Since the introduction of Apple’s new iPod lineup on September 1st, there has been a lot of commentary on the internet about the new iPod nano. While most people seem to view it as a worthy update that creates a very nice, focused music player, some people are upset with Apple for removing features that were in the previous generation of nano. I think they are wrong to perceive the changes negatively. Apple’s decision to go against conventional wisdom and remove features from the new nano makes sense, in my opinion. The previous generation iPod nano was tall and narrow, with a long screen and a touch wheel filling the front. The screen size was helpful for video playback. It also helped while recording video with the low resolution camera on the front of the device. 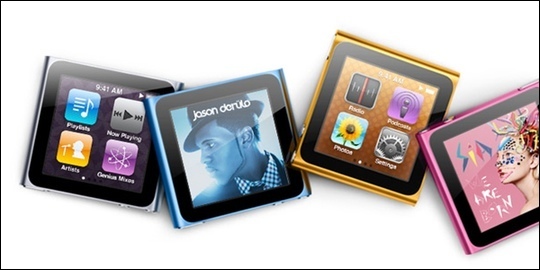 The new iPod nano is, by contrast, a small square unit with a multitouch screen filling the front of the device. It does not do video recording. It does not have a camera. It does not even support video playback. This is the fact that seems to perturb many Apple watchers — the nano used to be able to record video, and now it doesn’t. Apple claims that statistics show that most previous model iPod nano owners were not making use of the video recording capabilities. And though Apple wouldn’t openly admit it, the camera on the nano was nothing to brag about. Compare it to even an older Flip Mino and you’d probably never use the nano camera again. Watching video might seem like an important thing to throw out, but consider the fact that the iPod touch already had a much larger screen, a multitouch interface, complete internet and iPhone app access (read: games), and you can begin to understand why the iPod touch quickly became the best selling iPod and iOS device in existence. As of September 1st, the iPod touch now has the same retina display and A4 processor that the iPhone 4 introduced, as well as both front facing and rear cameras. I think it was very clear to Apple by this point that if you want video and photo capabilities, you’re going to want an iPod touch anyway. Given that the iPod touch had become the hands down winner in the best video experience on an iPod category, Apple was free to take the nano and make it back into what it was originally — a very small music player with an excellent user experience that performs its sole responsibility of playing audio very well. Apple has become increasingly popular, and as a result they are under more scrutiny than ever before. And that’s fine — competition is good, and I want Apple to avoid laziness and complacency. But in this case, I think people are just complaining for the sake of it. People who want video get an iPod touch. Apple recognized this and reformed the nano into a much better iPod that is optimized to be nothing but an excellent audio player. I agree that the video recording features were a bad move and not needed. It was almost like a hold out for the Touch to get a camera, but I was hoping for a better still camera in the Touch. As for video, I think that might be coming back. I think removing video may have been a mistake. I haven’t seen the new Nano in person, and maybe the screen is too small, but I think video playback was important. My father has the short Nano and he uses it for video when traveling and loves it. Sure, the Touch is better, but for those that want more storage and screen size isn’t important it works. As for the new design, I think it is great! The new Nano’s design makes sense for the kind of device it is, but it should have been called something else and the Nano retired. To take that much functionality out of it while not reducing the price doesn’t seem like a plus. They’ve given it a touch sensitive screen which doesn’t seem like a fair tradeoff.